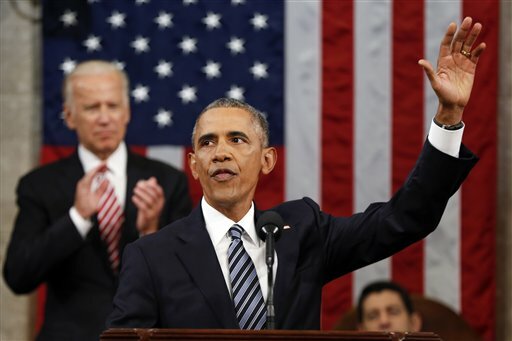 President Barack Obama opened his State of the Union speech saying he’d keep it short, in what must have seemed music to the ears of some in the chamber antsy to get to Iowa to campaign for president. At times, Obama looked like he was one of them, eager to challenge biting criticism from Donald Trump, Ted Cruz, Marco Rubio, Jeb Bush and other Republicans. Obama was at turns boastful and biting, confident and sarcastic. “The United States of America is the most powerful nation on earth. Period. It’s not even close. It’s not even close!” the president declared. The president’s final turn at the House podium was his most high-profile entry yet into the presidential race to succeed him. After largely begging off the day-to-day skirmishes in the raucous contest, Obama showed he was more than ready to defend his record and happy to use one of his last chances to seize America’s attention to show Democrats how he thinks it should be done. Obama has more than his party’s interest at heart. His legacy will be shaped by whether Americans choose a Democrat to succeed him and cement his signature heath care law, environmental policies and immigration programs. Democrat Hillary Clinton has tried to put some distance between her campaign and the president — often saying she’s not running for his third term. That has at times left Obama as his own best defender. The White House had billed Obama’s speech as a rethinking of the genre, and delivered. Obama only breezed through his remaining priorities — raising the minimum wage, overhauling the immigration system, tightening gun laws — even as he acknowledged they were unlikely to get done. He highlighted a few possible proposals with better chances — criminal justice reform and fighting prescription drug abuse. “Who knows? We might surprise the cynics again,” Obama said. The flip comment was a reminder that the speech, like the president’s final year in office, wasn’t focused on Congress as much as on defending his accomplishments. Obama took some clear shots at the cast of Republicans who’ve used him as a target for months. He defended his handling of the rise of Islamic extremism and tried to temper anxieties about the Islamic State group. With an expected audience of some 30 million viewers, the speech was Obama’s first of two chances to take Americans squarely by the shoulders and make his case for a Democratic successor. Not until his speech at the Democratic convention this summer, will Obama likely have such undivided attention again. The case he delivered was not new. The president and his aides have been marveling for months at what they described as Republicans’ gloom-and-doom vision. White House officials have labeled it both inaccurate and bad politics. Some of his arguments echoed the case he makes to donors at fundraising events. In trying to present an optimistic alternative, Obama’s speechwriters were mindful of not taking a victory lap. Americans hardly share his confidence in America’s upward trajectory, polls show. In touting the economic recovery, in particular, Obama risks seeming out of touch. But the president showed he was ready to rebut such comments — once Democrats pick a candidate and he’s unleashed on the trail. Until then, as he told his audience of lawmakers and candidates, he understands the hankering to get back to Iowa.